Less than 500 Newfoundland Ponies exist worldwide today. Fewer than 50 reside in the United States. We provide sanctuary to 22 of those some of who are in foster or adoptive conservation homes. At no fault of our own, less than half of our ponies are able to reproduce. Every pony who is not bred causes a loss of a genetic package important to breed survival. We have foals due in a few months and breeding begins again soon. Our 2020 anticipated foals are already spoken for, by conservation breed stewards. Each pony costs roughly $2000 a year to keep (which includes farrier, hay, grain, vet and supplies). Our farm runs entirely off of donations from caring people like you. These sponsorships are incredibly helpful and give us one less pony to worry about during the year. The Hands-on Pony Helper Sponsor - scroll down and pick a pony that lives on the farm, one that isn't already sponsored. (The available ponies have a green sponsor button near their photo below.) For $25 a month you can visit and play with your pony on Saturdays which is when the Center is almost always open. You will first be trained as a volunteer and caretaker. There is no riding involved as most of our ponies on premise are not rideable. However they are lovable and enjoy taking walks in the fields, being brushed, snuggled and just being silly with you. ​Pony hugs are the best! Pick your Pony and email us at newfoundlandponyinfo@gmail.com to arrange your sponsorship and training. Sponsor a pony for $100, a one-time payment, and we'll send you a custom T-shirt with your sponsored pony's photo on it! Email newfoundlandponyinfo@gmail.com ​​to order your t-shirt. Ammy is Rusty of the Black River and Dusty Greene lines. Named after his breeder's great uncle, who died in the coal mines of Newfoundland, buckskin Ammy stands 12.2hh. He is also the poster pony for the Center and our ambassador. In the winter of 2010, Ammy suffered a severe leg fracture after being kicked by a much larger horse. A sweet, gentle stallion, he came to us shortly thereafter, thinking we would have to have him humanely euthanized. Our vet, however, upon giving him a once over, informed us that the break was healed. He suffered no pain from it. So, we gave this beautiful boy a chance, and he was determined to live. Just look at him now. Even though the fracture left him disfigured and with a permanently disabled and fairly useless rear leg, he has learned how to get around almost as well as any other pony. He is a joy to watch as he playfully trots, and canters in his unique 3-legged way, obviously pain free. Ammy epitomizes all the wonderful traits of the Newfoundland Pony and has stolen our hearts. Much like the rest of the breed, he is an inspiration, a survivor against all odds. He adapted and evolved in his own lifetime, to make the best of his situation. Ammy has fathered only 1 foal before he was injured, a colt who is in Ontario. As he requires special help with breeding due to his broken back leg, we've tried but without success. ​Ace was born in May of 2016. He is from the almost lost Dancey and Rusty (not to be confused with Rusty of the Black River) lines. Being so rare he is a lovely match for many Newfoundland mares, including mares at the center and others in this country. Typical of the breed he was born a laid back youngster and remains so. Ace likes to eat breakfast in bed (i.e., lay down in the middle of his hay and eat around him). Friendly and well mannered, he has been taken under Ammy's tutelage on how a fine young colt should behave. Ammy is kind and looks out for him. Newfoundland stallions are not what most people think of when they imagine stallions (aggressive, must be kept alone, etc). Most of them are as docile as geldings, and they can get along with other stallions. This boy is going to make a big difference for the Newfoundland Pony and we are proud to have him. Ace has some dates lined up for this spring. From Princess Hawk, Prince Tamarack and Champion K lines, Heather stands 13.1hh. After a trailer accident, she's been permanently retired from riding.. Heather had 6 foals, 4 of which are registered purebreds. Her daughters, Mandy and Winsome, remain with her here on the farm. A talented pony though, just because she isn't ridden doesn't mean she's retired from everything. She is one of the ponies used in the Equine Assisted Learning Program (EAL). She drives, sleighs and is a wonderful ambassador of her breed. With her good looks, it's not hard to see how she wound up on our home page banner. Mandy is Princess Hawk, Prince Tamarack, Champion K and Rusty of the Black River lines. At 13.2hh, Mandy is quite the athlete and jumping is her forte. She is brave yet sweet and prefers to avoid conflict in the herd. A bit more drafty than her mom, Mandy is strong, steady and quick footed. She has a wonderful work ethic and is always game for anything. Mandy competed with her favorite volunteer, Emma, with her high school equestrian team. Despite Mandy having very little show experience, 1st, 2nd, and 3rd place ribbons piled up with this duo all the way to the states. Emma also showed Mandy at Equine Affaire in W. Springfield, MA, 2017. Mandy will be bred 2019. VPF Winsome Dream, foal of our beautiful Applewood Highland Winsome and Macosa's Dream, is Prince Tamarack, Champion K, and Rusty lines. Winsome (affectionately nicknamed 'Dooba') was born here on the farm. Upon the first vet check, the vet was surprised Winsome and Heather survived the birth, and we retired Heather as a mom. 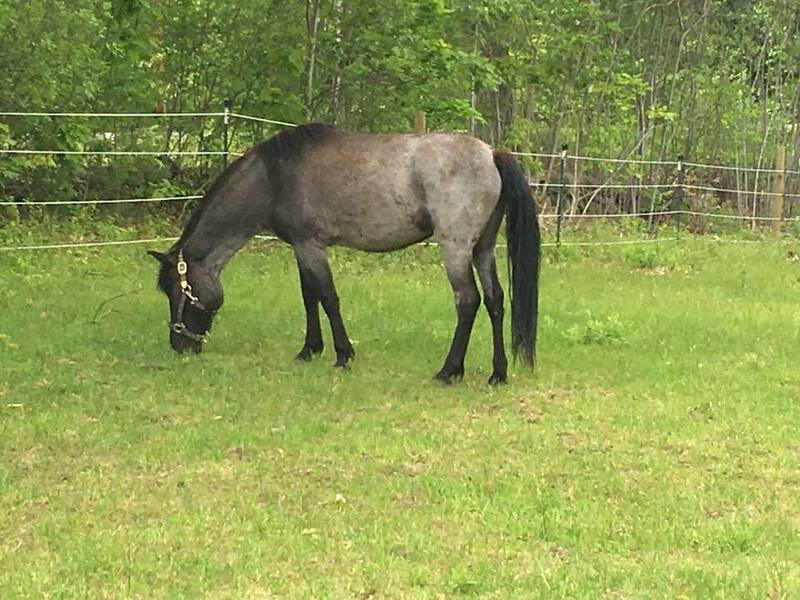 She's a radical color changer like her dad, which means her coat changes with the season - sometimes she's black, sometimes she's blue roan, sometimes she's caught between the two. Born with primitive webbing on her forehead, dorsal stripe, barring on her withers and legs, it comes and goes with her coat of many colors. A big mare, she stands 14hh. Winsome has been calm, outgoing, and like most Newfoundland foals very people friendly since the day she was born. She is our herd clown and loves being a part of the EAL course with the more serious participants. She can put a smile on anyone's face. Like most equines, Newfoundland Ponies are not fully mature until they are 6, which is when she will officially begin saddle training. And as we discovered, she can jump a five foot fence! Misty is of Champion K and and Kitty Ruby lines. The Center welcomed Misty to the herd in 2012. Not one who looks for attention, Misty stays a bit in the background but she adores children, especially the shy ones. There is nothing more endearing than having Misty quietly amble over to nuzzle your neck, completely out of the blue. Misty prefers being a work pony vs a saddle pony, happiest in her work harness, dragging logs or plowing fields, but is also a part of the EAL program with her friends. Misty also has the unusual gait some of these ponies exhibit. Her movement is very smooth and very quick, similar to a tolt. 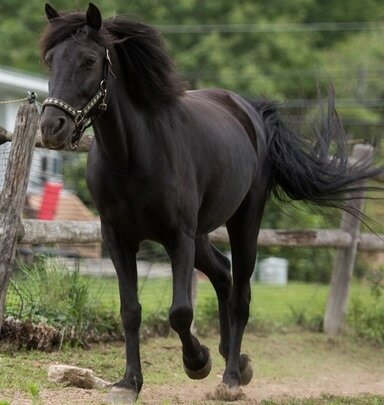 A recent study reported that roughly 12% of Newfoundland Ponies carry the gait keeper gene. All in all, Misty exemplifies the preciousness of landraces, with the gait of predecessors coming through. This gait is neither encouraged nor discouraged in this breed, as standard breed practices would do. Preserving landraces means preserving variety amongst them. Poor Misty has had many foals - most of which were colts who were gelded without offspring, leaving little behind to carry on her lines. We are breed stewards, which means we must consider the Newfoundland Pony's future. Each pony should have at least one offspring to replace it when they pass away, and one more to increase the herd's numbers. Without breeding and without responsible breeding to ensure the carrying on of those genetics into the future, this breed will disappear. NEWSFLASH - Misty may very well be in foal to Vinland's Cabot Chapman, and due this spring. Try as we may, Misty would not cooperate for an ultrasound or blood test but she certainly cooperated for Cabot during pasture breeding all summer. From Princess Hawk and Rusty of the Black River lines, Storm has no living offspring - her only foal passed away. One of our smallest ponies at 11.2hh, Storm comes to us courtesy of Equine Rescue Inc, Bloomburg, NY. Being our Misty's old friend, the rescue wanted Storm to have a "heritage home that is best suited for the Pony." Shy Misty has a friend now and this warms our hearts. But even being our smallest pony, Storm is the herd boss. She is no trouble but we notice no one gives her any either! 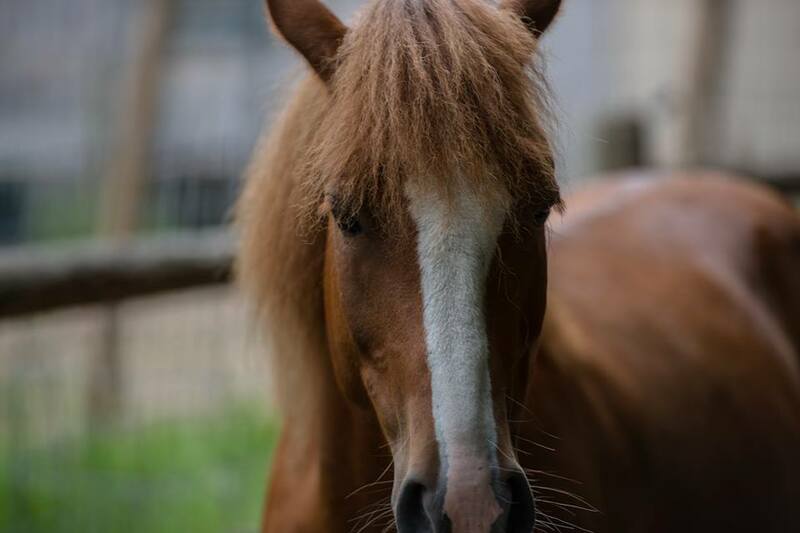 For a pony once considered 'dangerous', Storm can now be seen playing 'tag' and 'hide and go seek' with her favorite volunteer, Sam, or in our EAL program with children and adults. Storm is an excellent equine assisted learning pony! NEWSFLASH - Storm is confirmed in foal to Vinland's Cabot Chapman. Storm was Cabot's favorite mare in the pasture. Their precious foal is due this spring. A 1997 stallion, son of foundation pony Vinland's Star of the Sea, Cabot is on loan to the farm and currently fostered with one of our volunteers. He has only one living registered offspring, and Star of the Sea is a fairly rare line in an already rare breed. Cabot is a perfect match for all of the mares here at the Pony Center. He's a big boy, standing right on the edge of 14.1 and 14.2hh, and is a gorgeous bay. He's an older gent and has been having trouble keeping weight on due to dental problems. Did you know he's famous? He was the model for a Stone Pony collectible, selling for over $200 a piece! We anticipate at least 1 but likely 2 of our mares are carrying foals sired by Cabot, to be born this spring ( it's an 11 month gestation period for equines). These foals after having lived with the pony herd for awhile, will go to conservation breeding homes only, to ensure that they will be bred to save the future of this unique breed. We offer a conservation mentoring/cultivation program. Drop us an email for more information. Cabot has some dates lined up for this spring too! 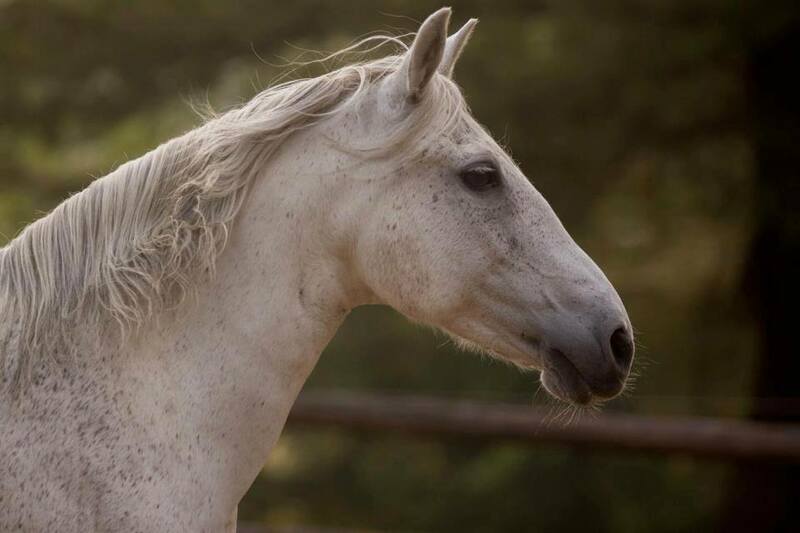 Smokey came to us as a gelding with no offspring, and is a Rusty and Rusty of the Black River lines, and one of the very few offspring of his sire, Beothic's Spooky, who has since passed away. Stunning Smokey came to us from Nova Scotia with his pal Erik. Smokey stole the hearts of every mare on the farm the moment he walked on the property. 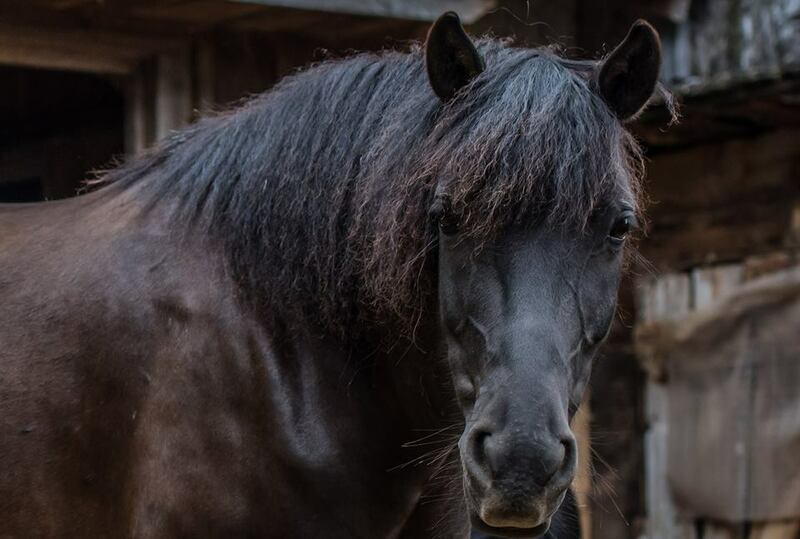 Poor Smokey has had a rough time of it recently - when he arrived to us, he was overweight and had suffered a bought of laminitis, and then during this summer after all the excess weight came off, we had trouble getting him to maintain it and build up lost muscle. Turns out the poor guy has Lyme Disease, and bad teeth. A quick visit from the vet and the dentist, and he's back to being the beautiful boy we know and love. A beautiful mover who loves to show off all that he is, in his past Smokey had a very bad experience while being trained to drive. Standoffish at first, he's not aggressive but shows no real interest in making connections with people as much as with the other ponies, and is never far from Erik. He made a wonderful Equine Assisted Learning teacher but he is now doing his part to save the breed by being in the Davis Farmland Heritage Breed animal exhibit, on loan courtesy of the Center. 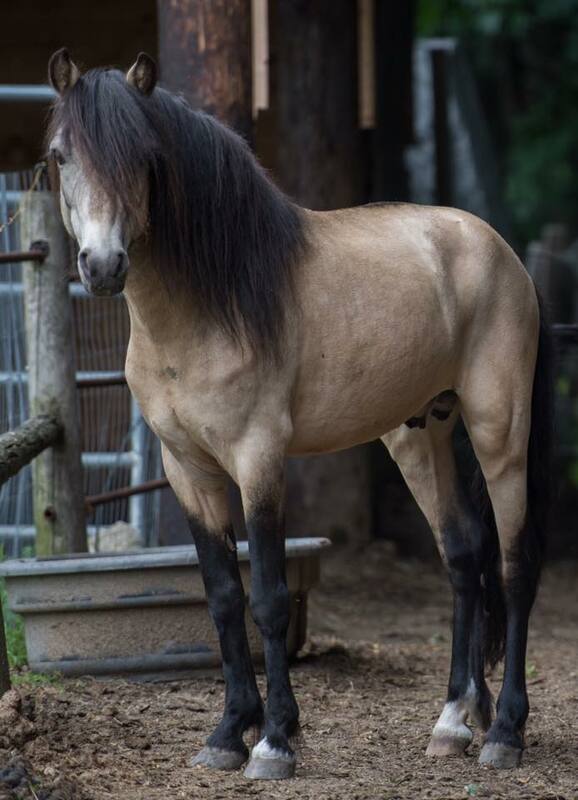 Known there as the "Super Morphing Power Pony", Smokey amazes the thousands of people who visit Davis Farmland every year because of his jaw-dropping frequent color change, something unique to this breed. Learn more about Davis Farmland. Hailing all the way from Nova Scotia, Erik moved in here with his pal Smokey. Known as Erik, this little gelding has a big build, big heart, and a big personality. Formerly our Pony Party 'go to', and EAL teacher, Erik has been ambassador at the Golf Club, the Jaffrey Fireworks Festival, a guest at the Amos Fortune Forum. He is Mr. Charming, outgoing and full of confidence. Erik is a "mystery pony" - his DNA did not match Foundation DNA records which make him ineligible for registration. Breed Profiling that we ran came back as #1 Newfoundland Pony, #2 New Forest, #3 Miniature Horse. Breed profiling is not 100% accurate and we do not support the current push to allow breed profiled ponies to be registered. Why? The Newfoundland Pony has NO genetic disorders whatsoever. None. Zilch. The majority of today's equine breeds do, and many carry lethal genes. As history has shown with other rare olden breeds, the adding of other modern breed's genes (generally to increase numbers quickly) can add that modern breed's lethal genes to the rare breed's gene pool. With low numbers, the percentage of effected ponies would be great, and the breed would dwindle to unrecoverable status. We would also risk adding other undesirable traits such as bad temperament. We use Erik as a teaching tool, as an opportunity to teach why using breed profiling to increase this healthy breed's numbers could lead to it's utter extermination. Today you will find Erik with his life-long pal Smokey at Davis Farmland, on loan courtesy of the sanctuary. They are super stars in their heritage breed exhibit seen by hundreds of people a day. A 2008 gelding with no offspring, Scronchions is named for an ingredient in a traditional Newfoundland dish. Copper in color, he is flashy and he knows it. Standing 12.3hh, Scrunchions has learned his place at the Center and in the world. An in your pocket pony, still if there is a way to be mischievous, he can find it. ​Scrunch is currently being used in an Equine Assisted Learning program in Maine where he is beloved and quite the character. Macosa's Dream, who i﻿s also the sire of our Winsome Dream. True and Winsome Dream are half sisters. True's dam is Cricket, an unregistered mare. Formerly a popular summer camp pony, True decided she was done with all that, and came to live at the sanctuary. She stands just shy of 14hh, and is a talented, beautiful mover. Sweet, trusting, and a super trail horse, she is enjoying retirement from the camp life, living the life as a beloved trail pony for a wonderful family. Since True's dam is unprovable as full-blooded, and although True is probably mostly Newfoundland Pony, she will not be used in the breeding program. 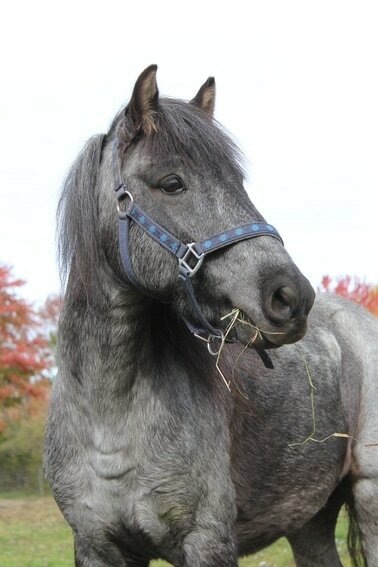 'Gaffer', a registered blue roan gelding without offspring, and has been a part of the Pony Center family since he arrived in New Hampshire in spring of 2017, despite never having set foot here. His previous owner was having saddle trouble with him. After a few months at his foster home, it turned out to be more of a project than his foster family was comfortable tackling, so he came to our trainer. 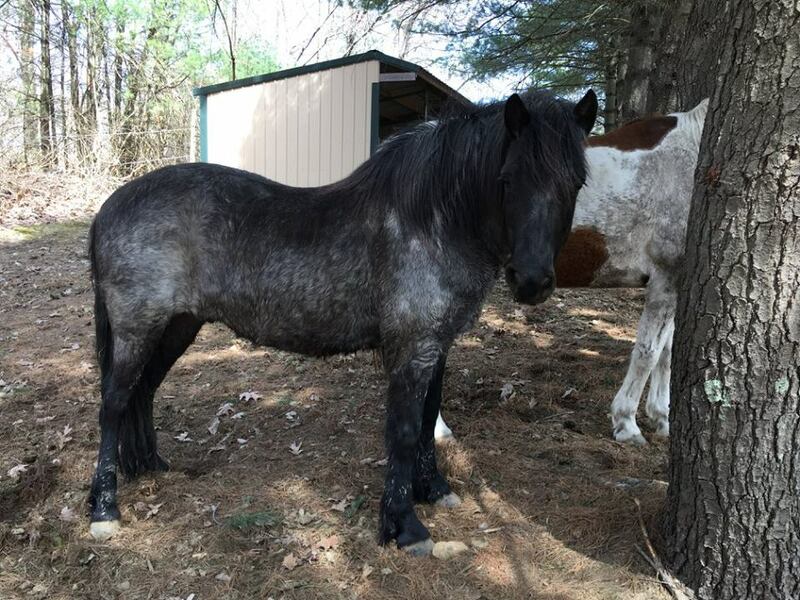 Turns out Gaffer's issue was just his saddle, and he has been adopted by a loving family who want to be a part of rare breed conservation and have their own youth at risk program in New Hampshire where Gaffer makes everyone feel safe and happy. Echo of Genesis aka "George"
Of Vinland Star of the Sea, Vinland's Rusty of the Black River, and Admiral Shalloway lines, George is a gelding with no offspring of his own. George was very kindly donated to the Pony Center by his owners from all the way in Quebec. A 5 year old gelding, he lived at a farm in Canada that had excellent pasture. Unfortunately, too much of a good thing led to laminitis, and a pretty bad case of founder in all 4 hooves. George is considered special needs, since he has rotation in all four hooves (20% in his right front). Horses and ponies who founder are prone to do so again, and it takes less to cause it a second time - which means George is on a dry lot only for the rest of his days. Very much loved by his family, they wanted to make sure that George would go to a place with other Newfoundland Ponies where he could be loved and well taken care of by children (which he adores). A perfect example of the breed, George now lives at the same therapy farm in NH, with our sanctuary pony, Deerfield's Gaff Topsail. Best pals, both ponies excel at helping children at risk and we are so proud of them. Holly is of Champion K and Princess Hawk lines. She is Heather's mom, making her Winsome and Mandy's grandmother, and Storm is her half sister. Holly and her daughter Lily came to us after their owner was in a bad accident and could no longer care for them. Their owner chose the sanctuary to help the breed but also knowing they'd get lots of attention as well. Holly and Lily are rare line ponies, a talented driving team, and just a joy to be around. A driving team, Holly and her daughter, Lily, have been together their whole lives. They were never trained to ride, but that doesn't limit them. We're hoping to get them back into shape for driving for sleigh and hay rides around the farm, and they managed to endear themselves to the NH Chronicle team. Of the Champion K line, Lily has no offspring of her own. We'd hoped that she was in foal to Ammy (via AI) for a 2017 foal, but it turned out what we thought was a baby bump was a false pregnancy. * One of our volunteers was crushed, since she'd called 'dibs' on the foal once she'd found out Lily was expecting. Lily stands 12.2hh like her mother, and is her matched driving partner. Sweet Lily is outgoing, calm, quiet, trusting and curious. She has a strong sturdy build and nice driving trot, like her Mom. One can't help but love Lily, the beautiful heart she wears on her forehead is the equivalent of one wearing their heart on their sleeve. Lily is in a foster home in Massachusetts with her mother Holly, still enjoying driving and lots of pony hugs. *Both Lily and Holly have been diagnosed with Cushings disease and are being treated. Holly did her job to help the breed by having 2 foals, but Lily has not. Breeding Lily would be a high risk pregnancy that we aren't willing to put her through, especially being a first time mother at her age.